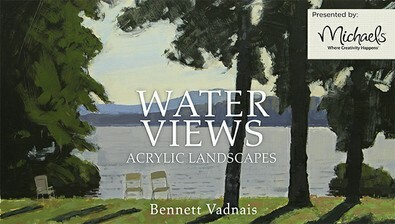 Explore the versatility of acrylic paint as you bring water scenes to life. Mix and apply colors to create harmonious depth in your composition, and learn how to accurately recreate the serene shades of sky and water. Use value to give flat-looking foliage volume and dimension, and discover expert shortcuts for creating natural textures like grass and bark. Paint realistic wave patterns and surface reflections to create compelling, dynamic water scenes.